Welcome to episode four of my new show, Marketing Marvels. If your marketing team has several irons in the fire at all times, collaborating can be chaotic. Your team most likely juggles an array of disconnected tools for planning, storage, social scheduling, design, and task management. Workfront was created to control all that chaos and enable teams to do their best creative work. It’s a suite of tools that supports everything from file sharing and design proofing to team management and reports. With Workfront, requests don’t get lost in a sea of email. Projects can be assigned, shared, commented upon, and delivered all inside a single platform. Joining me today for a guided tour of this amazing tool is Workfront’s CMO, Joe Staples. You’ll get an inside look at Workfront’s features, plus a free trial offer just for Marketing Marvels viewers. The Convince & Convert team is a big fan of Workfront—we even use it to produce Marketing Marvels! Watch the episode to learn what makes this platform so special. Jay: Hey, guys. It’s Jay Baer from Convince & Convert, and welcome to episode four of Marketing Marvels, where I help you discover new technology to help you become a better marketing professional. Each and every episode of Marketing Marvels includes an overview and a quick demo of cutting edge marketing software that I personally recommend and endorse, only stuff that I use, and stuff that I love, I bring to you on Marketing Marvels. If you’ve got questions, you can leave them in the comments. After the show either I’ll answer them or our special guest will answer your questions about the technology. Today’s special guest on Marketing Marvels episode four is the Chief Marketing Officer of a fantastic company called Workfront. He is the one and only Joe Staples. Joe, welcome to the show. Joe: Thanks, Jay. Great to be here. Thanks for that great intro. Jay: We are delighted to have you. Workfront is such an interesting and valuable tool because it really is a whole suite of tools. It’s a combination of multiple different things that we’ll look at here just a little bit in the demo. If you are an organization that’s creating a lot marketing execution, so, a lot of ads, a lot of digital ads, a lot of eBooks, a lot of webinars, even a lot of videos or a lot of social media posts, it’s really hard to track all that stuff. You’ve got some sort of crazy calendar, you’ve got Google Docs or Excel or some nonsense like that. Plus then you’ve got to figure out how to get everybody’s comments and do collaboration. Workfront takes all of those things and puts them in one tool. So you can do calendaring, you can do collaboration. You can store your own images and pull them in quickly and easily, you can get approvals. We love it at Convince & Convert. 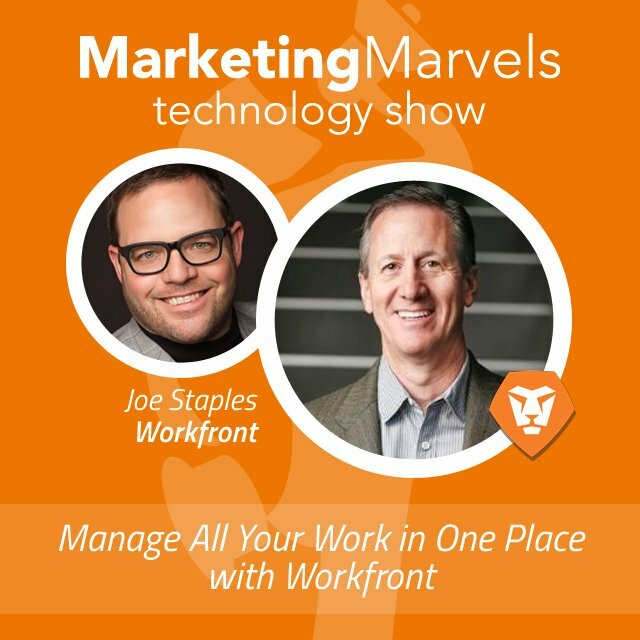 We love using Workfront to collaborate amongst ourselves and create great content like the Marketing Marvels show, ironically. So I want to get right into the demo and have Joe show you what it looks like because there are a lot of really cool features that I want to make sure you get a chance to see. So Joe, take it away. Let me turn up the demo here. Joe: Good. Thanks, Jay. I think your description was exactly right on with what most marketing teams experience. It’s kind of chaotic. It’s email, spreadsheets, Google Docs, all these things flying in and around from all kinds of different request spots and how do you control that chaos. That’s really what Workfront does. It provides some organization and structure around those things that allows you to do your best creative work. So to do this, we’re going to show you what a number of different people using Workfront would experience. Jay, you talked about the fact that it’s a suite of products, and we’re going to show you three main components to that suite. So we’re going to start by logging in as Conrad Hilton. So Conrad is going to be the requester in our demo this morning. He’s got a request and that request could be coming from inside the marketing team. It could be somebody from the sales team. It could be a field marketer that’s making a request of our creative services team. So he logs in and in this instance, he’s going to make a request for a change to the website, something that he wants new on the website. So he’s going to fill out the creative brief associated with that request. So you can see there were a number of things for him to choose from, but he’s going to give it a subject and go through and look at other pieces when he needs this to go live, all the things that you would think of in a creative brief that needs to be there so that the person doing the work would know exactly what’s being asked of them. He shows where on the website it’s going to be found, suggests some dimensions. If he’s got some ideas on copy, he could put it in there, but in this case he says, “You guys can decide this business pretty well.” He then submits his request. So for Conrad, this is great because he knows that this isn’t going to be lost in a barrage of emails. It’s going to be received by the team that does the work in this single location. So next, let’s take a look at Joan Harris. In this case, Joan is the project manager or the traffic manager sometimes she’s called. She uses Workfront to track all of her projects in one location, so kind of a single source of truth here. She fields incoming requests. She has a dashboard entitled New Requests so she can see what hasn’t been assigned out yet. That helps her identify that incoming work. So she’s going to convert this new request from Conrad into a project. She’s going to use the banner template because that’s what it fits into as she sees the request. Jay: Because they’ve done other banners in the past. So this takes that same project plan and applies it to the new work. Jay: Does she have the ability to determine the availability of those individuals to say, “This person’s got capacity or this person doesn’t have capacity”? Jay: And everybody else is sitting around. I know. It’s the worst. Joe: Right. You know what I’m talking about. Life’s great. Jay: This particular feature we haven’t used at Convince & Convert and I know our operations director is metaphorically licking her chops at this. Joe: Right. I think the other thing, the downside of this is what happens when you don’t have this visibility is you pick the best person because so and so always delivers for me. What you end up doing is burning out that person and not really developing the other people. So this really gives Joan this ability to look across the team, see who’s working on what, see who has what availability and then make the assignments based on that. Yeah, really good point. Jay: Do you find that this particular piece of it is very useful for agencies that are creating a lot of stuff for multiple clients? Joe: Yeah. We’ve got a lot of agencies. It might be the biggest growth area for our business just because they have so much coming in and going out. The faster they can produce work, the better their margins are going to be because they’re going to get better utilization of their people. So the ROI for an agency is really, really strong. All right. Let’s jump over and look at David White. David is the creative director. His role kind of inside of Workfront is to understand what his team members are working on and to manage new assignments to his team. So he’s got the ability to manage really any type of workflow methodology. Most marketing teams today tend to operate inside of a waterfall methodology but we’re seeing a really big uptick on people adopting agile, traditionally done by IT groups, but some really strong benefits to this Agile methodology. Jay: And in the agile thesis, the idea is you work on a few projects for a short period of time but put a lot of emphasis on a small number of projects and say, “This is what we’re going to accomplish collectively this week,” instead of saying, “This project is going to take us 50 days,” you’re saying, “What are we doing in the next five business days?” And then continue to refresh that list. It’s fascinating to me having been involved on both sides of it, I suspect that getting somebody inside a marketing organization or an agency organization to sort of understand and lead the agile methodology has to be a big change because most marketers have always been trained by a waterfall, “What’s next on the to-do list?” concept and agile is quite different from that. Joe: I think the former is the easier route and certainly the one we’re seeing most often with our customers. So they’re taking marketing teams, creative directors and they’re learning an agile methodology. We provide a number of webinars and whitepapers and trainings and workshop around this. Yeah. So great benefits to this and we’re really seeing some nice adoption. So in this case, David’s got the opportunity to see what his team is working on. This is a burndown chart. He can see how the latest iteration is progressing as they work through their sprint. Are they going to hit their dates? He’s got much improved visibility relative to the performance of the team. All right. Let’s go over to the guy that does all the work. So this is Rick. Rick is the graphic designer. So like most creatives, they went to school to be a designer because that’s what they like to do. Often times they can go, “Wait, structure, process.” They view that as kind of the archenemy of creativity. It’s really not. What we’ve found is the more structure there can be around work, so, for example, if Rick gets all of his work requests in a single location, he’s got more time to be creative, to do those things that he wants to do. But the other thing, another interesting thing about most designers is they don’t like going into a bunch of different applications. It kind of breaks their creativity. They like staying inside of that design tool. So for Rick, we’ve done an integration that he uses between Workfront and the Adobe Creative Cloud. So he is able to just from inside of Photoshop click over and log in to Workfront. That’s really the only distinction that he sees. Then everything else that he does is inside of that Adobe Creative Cloud in this case. So Rick’s already been working on this particular asset. So he’s ready to upload it to Workfront. In the Workfront extension, he’s going to choose which task he’s been working on. He’ll upload the graphic asset to that task to be reviewed and commented on and he can choose what kind of file he wants it to be and what he should call it as he exports it out to Workfront. Again, he’s working inside of Photoshop, but the people that are proofing or approving this aren’t necessarily. That’s why that link is so important, because these other people will go inside of Workfront to finish out their part. So this will automatically generate a proof because Rick is a proofing user and again, he only leaves the Creative Cloud to mark his task complete and then he’s going to move on to his next task, again staying inside of the Creative Cloud. Jay: He’ll get assignments based on what’s going on? Joe: Exactly. There will be a queue for him, most likely determined at the beginning of their weekly sprint. So you talked, Jay, about Workfront being a suite of products. So what we’ve talked about thus far is the intake and the management of workflow piece of the product, but now we’re going to take a look at the proofing component, so proofing review process. Our product is called ProofHQ. What it allows Rick to do is to have this proof generated and then it gets pushed out to those who are assigned to comment on and review it. So here we see the proof, in this case for David to review. So he clicks Proof. It will load the proof up. David can take a look at this proof. He can resize it. He can add comments to it. He can make various changes or suggested changes that he would like to see. So in this case, there’s a little change to the copy. It can expand out that copy, decide where he wants to see it placed. But again, all done inside of a proofing tool. Think of how proofing is done traditionally. It’s a nightmare. Things are printed out. I comment on something and then you comment on the same thing but your comment is different. It comes back to the designer and they’re going, “All right. Do I go with Jay’s comment or do I go with Joe’s comment?” It just creates revision nightmares. You drop something on somebody’s desk. They’re on vacation. You don’t know it. It’s a cumbersome process. Jay: When you’ve been using things like Google Docs or Word with comments, which is what a lot of people still use, it’s terrible. Everything you mark something as resolved, it spins off into their email. So now you’ve got an email box full of emails that say, “This has been resolved.” “What are you talking about?” It creates more work than it takes away. Joe: Yeah. So to just follow on with that point, I think the biggest benefit to Workfront is there is a single source of truth. So it’s not buried in somebody’s inbox or, “Is this a Google Doc? Did you send me an email about this? Oh no, this is when we talked in the hall last week.” It really comes down to no, for any project that comes to our marketing team, there is a place for this to happen. You talk about adoption, that’s one of the primary things that influences the success of adoption. If the people who are doing the work say, “Don’t call me. Don’t walk up to me and tell me in the hallway. Don’t write me a yellow sticky and stick it on my monitor. Put it in Workfront.” Then everybody’s happy at the end of the day. So back on Proofing. We looked at this one, but we just introduced rich media proofing, which is . . .
Jay: Like videos and audio clips and stuff like that? Joe: Exactly. You think about how cumbersome it is to proof a static image, one single piece of paper. You produce a ton of videos, you know this, how hard it is to go through a proofing and approval process on a video. Jay: You’ve got to write down the time code. You’ve got to sit there really, really carefully and watch it second by second and then pause it real fast, write down the time code, put that in a Google Doc or a Post-It or whatever and say, “Okay, add the YouTube card at 12 minutes and 14 seconds,” is crazy. I did a new sizzle reel for my speaking stuff earlier this year. We had to pull in 25 different clips of me giving speeches in different places and mark the time codes and where we’re going to cut it. It was terrible. It was like the world’s worst Google Doc. It was extraordinary. I felt really bad for Simplifilm, the guys we use for that kind of work. This would have been extraordinary. So where were you six months ago, Joe? Joe: I know. Either we were late or you were ahead of your time, one of the two. Jay: We’re going to call it both. Joe: But instead, using our proof HQ product, you go through the video, you see something you don’t like, you pause, you comment on that particular frame and anybody else who is also reviewing it sees everybody else’s comments. So it’s much more of a collaborative effort than, “I review it. You review it. She reviews it.” Then we’ve got all kinds of conflicting comments. HTML files also included in that rich media proofing piece. So animated digital ads that you may be creating, again, without having to try and figure out, “How do I stop this so I can comment on the second part of the animation?” In ProofHQ, you just freeze it right there, make your comment and it goes back to the designer to correct. So really a great productivity tool. Let’s talk about one last piece for David. So David, he approved this. He likes how the ad looks. He is now going to publish it or distribute it. So another part of the suite is Workfront DAM. So here, David is going to upload this final ad to Workfront DAM. Pretty simple process. He clicks it. He decides what area it’s going to go into, any other components that he needs to associate with that file. He clicks Save. It is now published and available to be distributed to outside resources as well as internal resources. One last look, let’s look at Karen. Jay: That’s certainly a lot easier than putting it in Dropbox or emailing it or whatever else you’re going to use. Joe: Exactly. You think of the relationship between an agency and a marketing team, great opportunity to share things that way, make sure everybody has the latest file with all kinds of tracking as to who’s accessing it and what they’re accessing it for. So our last person here, Karen Sterling, she’s the CMO or the VP of Marketing. Now, Karen is not in there doing actual design work. She probably has a number of things that she does on the proofing and approval side. She really is, her job mainly is to manage that marketing team, what they’re doing and how they’re doing. So we provide for Karen as an example a great calendar view. She can see what the team is working on. She can see specifics around different kinds of channels, different kinds of assets that are being created. She can drill in to any of those kinds of at a moment’s notice and look at a specific project and what the status of that project is. She can see if it’s on track to be completed on time. She can see if it’s on track to be done under budget as well. There’s also some great reports that she can run on an ongoing basis to kind of, again, manage, effectively manage her team. So it really gives her the overall view of her team, what’s going on and identifying any projects or any problem areas that she really needs to focus on. That’s it. Jay: That’s really powerful, that ability to just at a glance see are we on time, are we on budget. And the budget numbers are not hard costs, media costs. It’s time costs, right? We expect this to be this many hours at this much hourly rate and here’s how many hours of staff time we’ve actually invested. Jay: Yeah. That’s extraordinary. You’re right. Usually it’s anecdote and who can tell a better story. Joe: Right. Who talks the loudest, the fastest? Jay: I’ve been there. I’ve walked a mile in those shoes. This is really fantastic. I love it. If you’re a marketing organization and you have always done things the hard way, I guess I’ll get back over to your camera here, and you’ve done things the hard way and now we’re saying, “Okay. Let’s do Workfront,” I suspect that that’s a fairly significant cultural change. How do you onboard something like this? I imagine it’s got to be pretty tricky. Joe: It is. We put a lot of emphasis around change management. We have a great team of consultants that we’ve literally done thousands of these implementations. So it’s pretty easy for us to come in and say not only here’s how you use the product, but here’s how you get adoption of the product. The product is DOA if you can’t get people to use it obviously. Jay: It’s got to be everybody, too. You can’t have some people using it. Everybody has to use it. Joe: Right. Yeah. Single source of truth can’t be partial source of truth. Jay: That sort of invalidates the premise. Exactly. Jay: If you’re a big company that has a lot of stuff, this is the perfect solution, right? If you’re doing a lot of marketing executions and you have multiple staff members and you’re trading stuff off, this is the perfect solution. If you’re not doing that much stuff and everybody’s sitting in one room or you don’t have third parties, it’s probably more than you need. Joe: That’s right. If you look at this and you say, “You know what? We do this with spreadsheets and emails because there are three of us on the team and the close collaboration is easy enough.” This is overkill. Don’t break it if it’s working for you. But for a team of any size, for a content team, a creative team, a marketing ops team that has multiple projects and a lot of different requesters, then this can really make a big difference in controlling that chaos. Jay: You charge for a monthly fee, it’s SaaS-based? Joe: It is SaaS-based. Yeah. All in the cloud and quite affordable, I must say. Jay: I agree. It is actually in my estimation remarkably affordable considering how full featured and well-integrated the tool is. I was actually surprised at what the actual price point is. If you want to kick the tires on a piece of this, I absolutely suggest that you do this, especially for all my content marketing and social media marketing friends out there who are doing a lot of eBooks and webinars and videos and those kinds of things, grab a free trial, Joe and his team have extended a free trial to viewers of Marketing Marvels. You can check out the ProofHQ proofing tool, which I use all the time, love it, love it, love it. Go to ProofHQ.com/Free-Trial. That’s ProofHQ.com/Free-Trial.html and you will see how to provide a little bit of information and get a two-week opportunity to kick the tires on a proofing tool for free. Then obviously if you like that and you will, you’ll then have the opportunity to get involved in all of the requesting and project management stuff and all the other great things that Workfront does. Thanks so much, Joe. That’s really nice of you to make that available to Marketing Marvels viewers. Jay: How did you get involved in this? How did you come to be the CMO of such an interesting marketing technology firm? Joe: So I don’t know how well people outside of Utah know, but the tech sector in Utah, which is where we’re based, is exploding. There’s a tech company on every corner, literally. So I’ve lived in Utah for a while but commuted to my last venture for nine years to your neck of the woods, to Indianapolis. I latched on to Workfront. I’ve been a CMO or EVP of marketing for 20 years now and when I was introduced to Workfront, the thing that excited me about it was one, we’re selling to marketers, which is exciting for a marketer to get to do. Joe: And then second is how extensible it is. It doesn’t really stop with marketers. We’ve got a lot of IT customers. We’ve got customers in the banking and financial sector, really anybody that’s managing projects or large amounts of work can utilize the tool really, really well. So I was excited about that. The opportunity opened up and kept me a lot closer to home. Jay: Yeah. Good for you. I love that opportunity, for sure. What’s interesting about the tool is it’s multiple things put into one suite, as we’ve talked about, which makes it extremely useful. Also, you can add more things to it. I know you have plans to do that, none we can talk about today. But there will be other modules in the Workfront universe that makes it even more useful for people trying to create a lot of work, which is great. Joe: So not who is a marketing marvel, but what is a marketing marvel? Jay: Either way. Whatever you want. Joe: Can I answer both questions? Jay: You may. You can answer whatever you’d like, Joe. Joe: So the who marketing marvel, I love reading and listening to senior marketing people that have new and fresh ideas. I think there’s a lot of stuff that’s just been kind of reground and regurgitated and you look at it and you go, “Learned that one six years ago. Learned that one eight years ago.” But there are some people out there that are really talking about more innovative thinking around marketing. Seth Godin was our keynote speaker at our user conference a couple weeks ago. He’s one that I throw in that category. So I’m constantly, if you look at the who around marketing marvels, I’m constantly looking for those people that really have some innovative ideas. The what, mar-tech, our mar-tech stack of what we use here at Workfront is probably about I would guess about 15 different products. There’s just so many cool things out there that for a little bit of money, you can optimize some portion of what you do in marketing. I think the one that stands out for me, we’ve been using it probably for two and a half years, is a product called Influitive. Jay: Love those guys. I keynoted their conference not too long ago. Jay: Love those guys. They’re not a sponsor of ours, but we want to work on that. They’re perfect for our influencer marketing podcast that we have called Influence Pros. Explain how you use it. Joe: Yeah. So I think the right target for a CMO is to turn everything that you do relative to marketing, the end goal is to bring customers on board that turn into advocates. Advocacy marketing is so powerful and I think most marketers know how to do advocacy marketing but don’t know how to really start and manage that process. That’s what Influitive lets us do is to create a website, issue challenges, to provide rewards to our customers that advocate on our behalf. It just provides a structure around it. So I think the convergence of marketing and customer success is actually the next thing that we’re going to see really, really powerfully. Jay: If only somebody wrote a book about that, that would be amazing. Jay: We are singing out of the same hymnal, my friend. Jay: The thing about Influitive which is cool is they’re so smart to focus on B2B software. There are lots of solutions out there for consumer-facing advocacy and influencer kind of platforms. Zuberance is one that we like an awful lot that is one of our partners. Influitive is like, “We’re going to focus on this part of the business and do it really, really well for companies like yours. They really have it buttoned up. I like them an awful lot. So good choice. Joe: I also think that they don’t . . . it’s not a heavy lift to kind of use and get implemented. I’ve seen some other ones where you really have to twist somebody’s arm and talk them in to doing something for you. This just provides a structure where you can figure out what motivates those customers to advocate on your behalf. You can track it, setup competitions and you’re off to the races. Jay: No kidding. We have to get them on the show. They’d be a good participant in Marketing Marvels and look under the hood. Joe: I do think it would be fair, though, if you asked them what technology they love that they would reciprocate. Jay: We can certainly tip them off. Joe: It would only be fair. Jay: Yeah. I think that’s the idea. Thanks so much for being on the show, Joe. Thanks to everybody at Workfront for your partnership and the great work that you’re doing. I cannot wait for some of our viewers and fans to get into the Workfront universe. It’s going to change the way they do business. I mean that quite literally. Next show, when are we going to do the next one? Actually pretty soon. We’ve got a new episode of Marketing Marvels coming up pretty soon, episode five. It’s going to be with the guys at Zignal Labs who we love. They are really, really creating a better mousetrap around listening and real time market intelligence, it combines social listening with television listening with print listening, everything in one place, real time, here’s what’s going on in your space, fantastic stuff. So Tim Hayden, who’s their CMO is going to be on Marketing Marvels next. Excited about that show and looking under the hood of their solution because it does some pretty crazy stuff. Remind everybody one more time, Joe, about the free trial of ProofHQ, two weeks. Go to ProofHQ.com/Free-trial.html to spend a couple of weeks hanging out with the ultimate proofing tool, ProofHQ. Joe, when are we going to get together? We’ve got to do this in real life one of these days. Joe: Let’s do it. We’ve shared a stage before. Let’s do that again. Jay: I know. Let’s do that again. That’s a good idea. I fly through Utah a lot to get to the West Coast from out here. So next time I’m just going to change my flights and we’re just going to hang out. Joe: Good. Sounds great. Thanks so much for having me. Jay: Yeah, good to see you. Take care.